Peaches need care in their growing, their storage, their transportation, and in their baking. Bakers may not be able to control some of these things, but they can control how they are cooked. 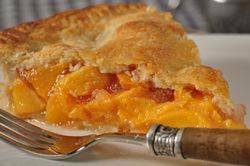 One of my favorite ways to use fresh peaches is in this Peach Pie that combines two buttery crisp layers of pastry with lightly sweetened slices of fresh peaches. This is a perfect dessert on a warm summer's night preferably with a small scoop of vanilla ice cream. The two components of fruit pies, are a crust with good flavor and texture, and excellent tasting fruit. For me, nothing beats Pate Brisee (a short crust pastry) that is made from a mixture of flour, sugar, salt, butter, and ice water. It has a high ratio of fat to flour which gives the pastry its crisp and crumbly texture and buttery flavor. It is easily made in your food processor and is quite easy to handle. Just be sure to flour both your work surface and rolling pin to prevent the pastry from sticking, and keep turning the pastry as you roll it out so it has uniform thickness. As I said above, a fruit pie must also start with good quality fruit. The first thing you need to know is that there are two types of peaches, 'Clingstone' and 'Freestone', with many varieties within each classification. The names (Clingstone and Freestone) refer to how easily the flesh of the peach separates from its stone. The Clingstone (available in late spring/early summer), is exactly that, the flesh clings stubbornly to the central stone or pit. Freestones (available late summer) have a flesh that is easily separated from the stone. When buying peaches, smell and feel them. The peach should smell like a peach and feel firm, yet have a slight give when you press gently on its shoulders. Make sure there are no bruises, cuts, or soft patches. The amount of red blush on a peach is a sign of its variety, not its ripeness. Peaches will not ripen or become sweeter after they are picked but they will soften and become juicier in a day or two if left at room temperature. Ripe peaches can be stored in the refrigerator for a couple of days. Pie Crust: In a food processor, place the flour, salt, and sugar and process until combined. Add the butter and process until the mixture looks like coarse crumbs (about 15 seconds). Pour 1/4 cup (60 ml) ice water in a slow, steady stream, through the feed tube until the pastry just holds together when pinched. If necessary, add more water. Do not over process or the pie crust will be tough. Peach Filling: Meanwhile, place the peaches into a large pot of boiling water for about 30 seconds to 2 minutes or until the skins soften (the time will depend on the ripeness of each peach). Immediately transfer the peaches to a large bowl of ice water (this stops the cooking process). The skins should now slip easily off the peaches. Cut the peaches in half, remove the stones, and cut the fruit into thick slices or chunks. Place the peach slices in a large bowl and toss with the lemon juice. Then gently stir in the sugar, tapioca, and salt. Cover the bowl with plastic wrap and let stand, at room temperature, for about 30 minutes so the peaches have time to release their juices, the sugar can dissolve, and the tapioca becomes nice and plump. Meanwhile, after the pastry has chilled sufficiently, remove one portion of the pastry from the fridge and place on a lightly floured surface. Roll into a 12 inch (30 cm) circle. (To prevent the pastry from sticking to the counter and to ensure uniform thickness, keep lifting up and turning the pastry a quarter turn as you roll (always roll from the center of the pastry outwards).) Gently roll the pastry around your rolling pin (brushing off any excess flour as you roll) and transfer to a 9 inch (23 cm) pie pan. Tuck the overhanging pastry under itself. Cover the pan with plastic wrap and place back into the refrigerator until chilled. Then remove the second round of pastry from the refrigerator and roll it into a 12 inch (30 cm) circle. Transfer to a parchment lined baking sheet, cover with plastic wrap, and place in the refrigerator until chilled. Preheat the oven to 400 degrees F (200 degrees C) and place the oven rack in the lower third of the oven. Remove the pie crust from the refrigerator and gently pour in the peach filling. Dot with the butter. Moisten the edges of the pie shell with a little milk or water and then place the top crust over the peaches. Tuck any excess pastry under the bottom crust and then crimp the edges using your fingers or a fork. Using a sharp knife, make 4 - 2-inch (5 cm) slits from the center of the pie out towards the edge of the pie to allow the steam to escape. With a pastry brush, lightly brush the top crust with a little cream and sprinkle with granulated white sugar. Bake the pie for about 50 - 60 minutes or until the crust is a deep golden brown color and the juices are bubbling and thick. If the edges of the pie are browning too much during baking, cover with a foil ring. Place the baked pie on a wire rack to cool for at least an hour before serving. Very good with vanilla ice cream. Leftovers can be covered and stored for a couple of days at room temperature or in the refrigerator.